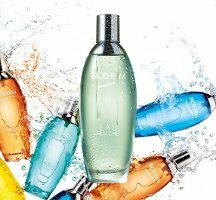 Biotherm will launch Eau Fraiche, the latest in their series of perfumed body sprays (Eau d’Energie, Eau Vitaminée, Eau Pure, Eau de Paradis and Eau Océane). A scented rain, a hint of pear and a dash of spice. The essence of freshness. Eau Fraiche is a fresh fruity floral, and was developed by perfumer Antoine Maisondieu. Additional notes include bergamot, violet leaves, apple, jasmine, coriander, cedar and musk. Biotherm Eau Fraiche will be available in 100 ml Eau de Toilette.